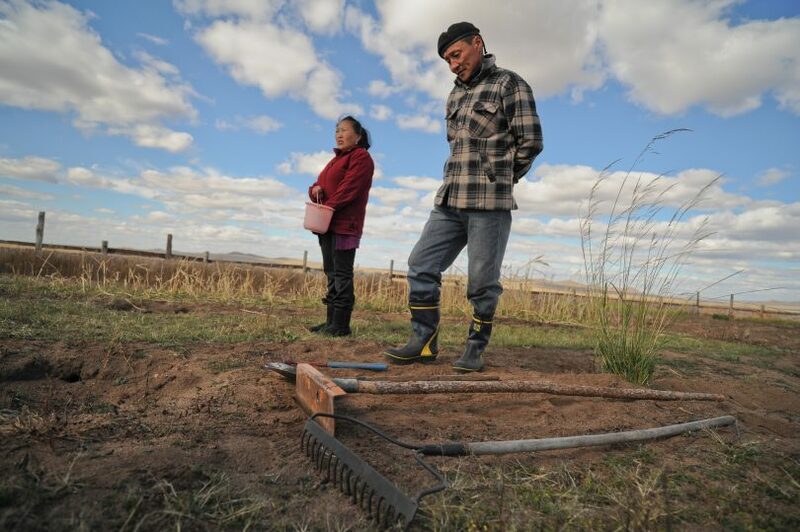 In Addis Ababa in 2015 the donor community reiterated the pledge from Copenhagen to provide $100bn per annum to the developing world to help them mitigate and adapt to the consequences of climate change. The multilateral development banks (MDBs) were seen as an important channel to support both mitigation and adaptation efforts. In Paris, the UNFCCC requested the MDBs to increase their efforts in providing funds to help developing countries cope with climate change. Given that the countries adopting these resolutions are also the shareholders of the MDBs it is not surprising that the Banks have responded positively to these exhortations to greater efforts. I want to examine here the EBRD’s efforts, but in the context of the overall international financial institution (IFI) response to the challenge of climate change. 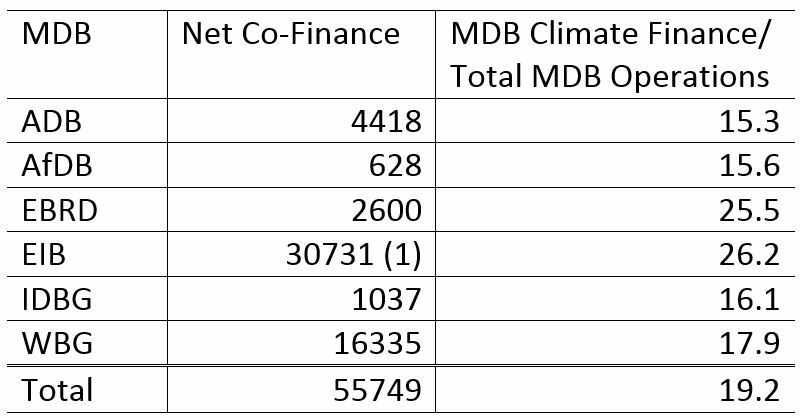 The 2015 Joint Report on MDB Climate Finance indicates that in that year the MDBs included in the Report collectively committed $25b in climate finance (Table 1). The report also shows that the relevant MDBs mobilised a further $55b in co-finance, making a combined $80b investment impact. 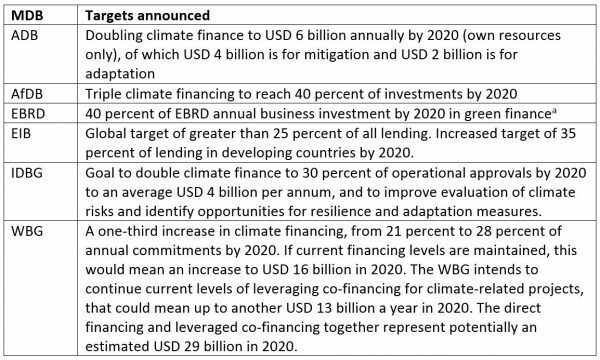 It is also noteworthy that the EBRD is an outlier in the proportion of its activities committed to climate finance (Table 2). Analysis of EBRD’s performance in this sector indicates that as well as being good for the planet it has also been good for the bottom line. 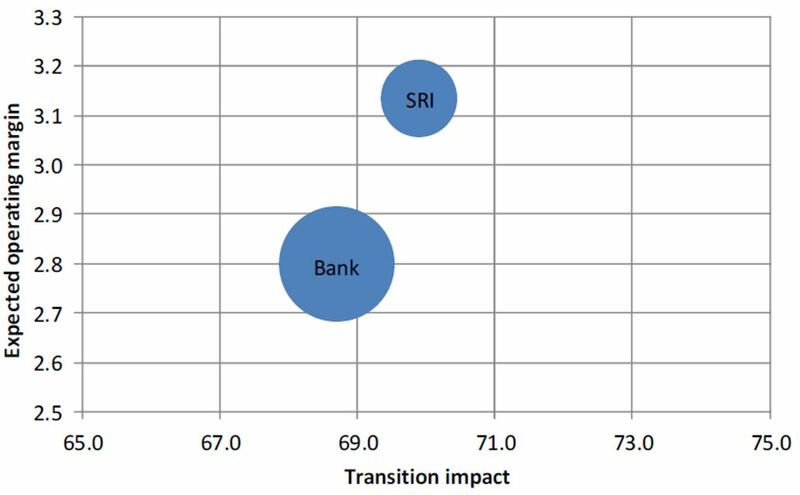 The EBRD’s Green Economy Transition Approach paper of 2015 shows that in the period up to 2014 the expected operating margin on Strategic Energy Initiative (SEI)/Strategic Resource Initiative (SRI) projects was approximately 3.1% against a Bank average of approximately 2.8% (Figure 1). The EBRD shares with the other MDBs an ambitious agenda to increase its investment in climate mitigation and adaptation, as shown in Table 3.
aThe EBRD’s Green Economy Transition (GET) target of 40% Annual Business Investment by 2020/EUR 18 billion over five years from 2016 refers to all green investments by the EBRD. This is composed of climate finance for both mitigation and adaptation as well as finance for projects with a positive environmental impact e.g. environmental remediation. EBRD does not have separate targets for these categories. 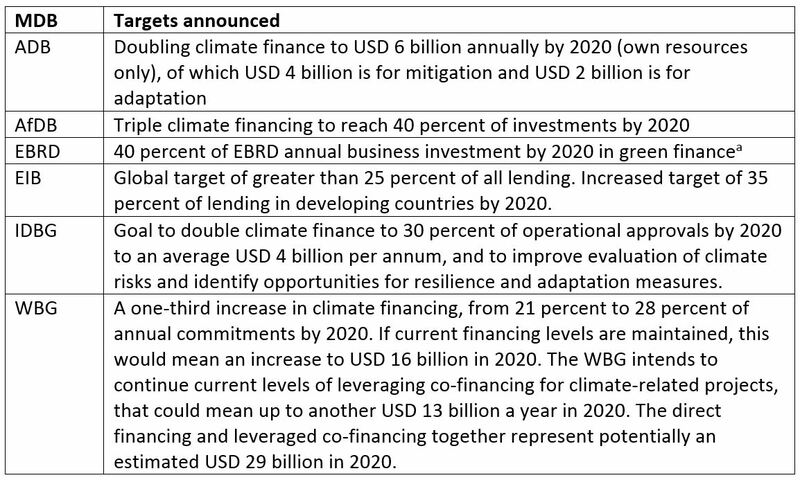 Nevertheless, it is expected that the bulk of the finance will be classified as climate finance under the joint MDB approach, in line with the current investment focus of the EBRD. 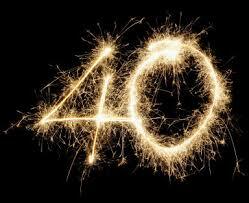 In fact, the EBRD just reported that it is well on the way to achieving its commitment in Paris. In June the President of the EBRD, Sir Suma Chakrabarti, stated “We invested one third of our investments in the green economy in 2016. We are well on target to meet our 40% goal for 2020 which we set within the framework of the Paris Agreement”. In the first 5 months of 2017 the EBRD invested €913m in green finance, an increase of 85% compared to the same period last year. Not all of this green financing will be directly related to climate change, but the overwhelming majority of it will be. As of mid-June 2015, the EBRD, through its Strategic Energy and Strategic Resource Initiatives, has reduced carbon emissions by 70 million tonnes/year. This has been achieved by a variety of methods. 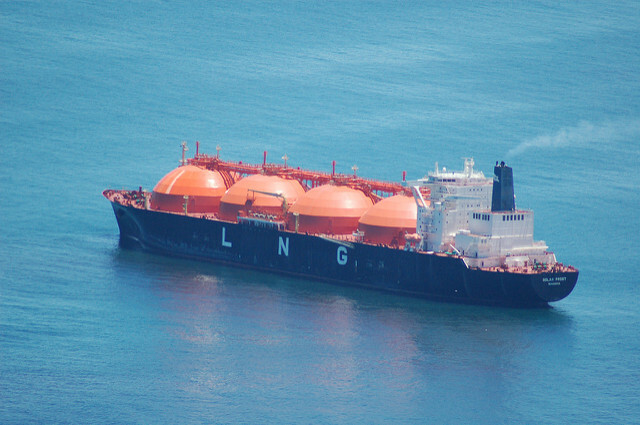 Investment which has led to annual production of 60 million MWh/yr. of renewables has been a leading driver of carbon emission reductions, but Sustainable Energy Finance Facilities (SEFFs) have also proved an innovative and successful model. The MDBs have also proved to be important conduits for the efficient use of multilateral funds. This global wholesale/retail model is also very important for efficient global reach of funds such as the Green Climate Fund which would otherwise have to replicate the distribution models already well established by the MDBs. As a member of the UN High-Level Advisory Group on Climate Change Financing (AGF) I was concerned to hear of proposals which would have meant a UN Fund with its own distribution system for climate funds. That we have come to a much more efficient model is to be greatly welcomed. 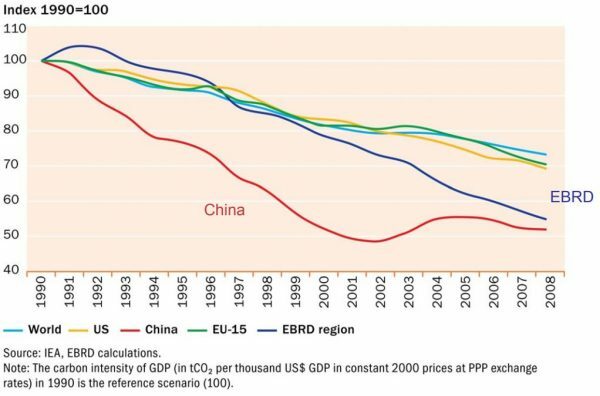 In one sense, the EBRD had an easy task. The energy intensity in the former Soviet economies was very high when the EBRD started operating there (Table 4). Any change would have had to be an improvement. However, later data suggests some significant progress in at least some of the countries of operation (Figure 2). All the IFIs have included a policy dialogue component in their suite of measures to respond to climate change. This is important because, no matter how much international support comes from external sources, it is the domestic policy environment and independently generated and funded investments which will be the major determinant of success. It is also important not to overstate the contribution of policy dialogue. If a government is willing to act, IFIs can provide technical support to enable them to take advantage of the experience of other countries. This can be very useful in structuring feed-in tariffs or developing a domestic carbon market, for example. 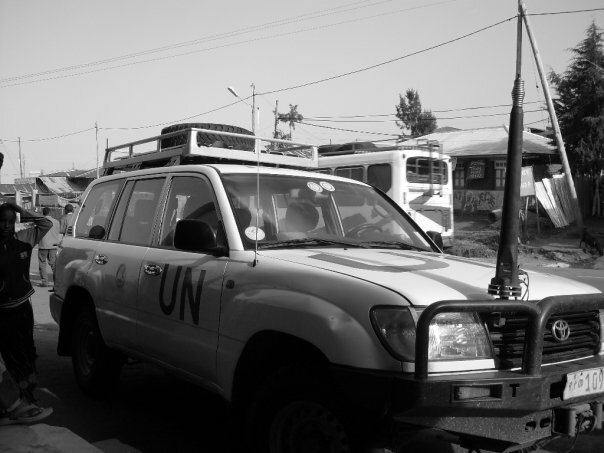 However, if the government of a country is not prepared to act, IFIs can realistically have little influence. The IFIs have invested in both public and private climate finance projects. As Figure 3 shows, the EBRD has been an outlier compared to other IFIs as it invests a much higher percentage in the private sector. This is a function of the larger private investment focus of the EBRD’s mandate. It has allowed the EBRD to develop a particular expertise in mobilising private sector investment for climate related purposes. Overall, the results indicate that the IFIs are proving important contributors to the challenge of mobilising $100b per year for climate finance. 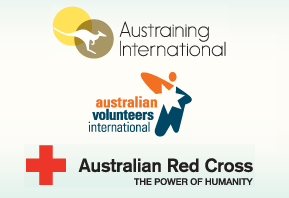 Given the domestic political constraints on Australian action it may be that participation as a shareholder in the IFIs in general, and the EBRD in particular, may be Australia’s most effective contribution to the global call to mobilise huge sums to assist developing countries in responding to climate change. It is also clear that mobilising private sector finance for climate change mitigation, and possibly also for adaptation, is crucial to the task of equitable actions which are sufficient to meet the climate change targets set in Paris. Bob McMullan is a Visiting Fellow at the Development Policy Centre. Bob McMullan has had a long and distinguished career in the Australian Parliament as one of Australia’s pre-eminent Labor politicians. He is a former Parliamentary Secretary for International Development (2007-2010) and Executive Director for the European Bank for Reconstruction and Development. He is now Adjunct Professor at Crawford School of Public Policy and a Visiting Fellow at the Development Policy Centre.